Did you know you can now order your Deliveroo takeaway from La Fibule Moroccan Restaurant here on View? La Fibule serves authentic Moroccan cuisine in a relaxed atmosphere. This is the place to go if you want to enjoy delicious food served by friendly staff. Do you work at La Fibule Moroccan Restaurant? What did you think of La Fibule Moroccan Restaurant? We were a group,went there and ordered the original lamb couscous with veg. They said it's not in the menu but they will prepare it for us.after more than an Hour.they brought us the dishes,we were shocked with the portions!! it was very small amounts of everything.But to be fair,the taste wasn't bad. Service is bad,some of the waiters were really tough,very expensive compared to the portions and other moroccan restaurents. Would not recommend it to anyone ever!! 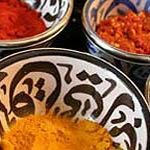 Cosy, casual, and popular, La Fibule brings the tagines and mezes of Morocco to Moseley at reasonable prices and, for the most part, does it well. Rubbing shoulders with Spanish, Italian and Indian venues on what is without doubt one of the city’s most pleasant suburban dining streets; La Fibule’s decor is decidedly Moroccan but not sufficiently full-on to frighten away the less adventurous. It is set on two levels with conventional tables and chairs, and an area where diners seeking a more authentic experience can lounge on cushions and eat from a correspondingly low table. This is the best spot to bag - it seems special and fun although, obviously, your arthritic granny or obese friend might disagree. Some of the tables-for-two are a bit cramped, and sitting by the front door means enduring regular banging as customers come and go (far more frequently since the introduction of the smoking ban, of course) with chilly drafts if the weather isn’t great. To the rear, chefs bustle in that reassuring feature-of-the-moment, the open kitchen. Customers are polite, middle-class locals. Even a long table of 16 does not become remotely rowdy. That isn’t to say the room is subdued: the vibe is animated and relaxed. The most fun is probably to be had by coming as part of a large group where everyone can order and share different dishes, although a couple who were clearly on a first date seemed content, too. Service is smiley and well-meaning but erratic; all over you like a rash or absent without leave just when you want to order mint tea or the bill. There has been murmuring of the fare becoming less authentic since the place opened. However, there are still plenty of tempting North African meat, fish and vegetable kebabs and stews to try. Vegetarians would certainly not feel disadvantaged here, and piscetarians rave over the seafood platters. An aubergine starter is a generous portion of super-smooth, well-flavoured puree with a characteristic puddle of olive oil in the middle, served with delicious, warm, crunchy bread for mopping up. Sardines, cooked and served simply with just a drizzle of dressing, also hit the spot. Lamb is clearly this cuisine’s number one meat and the tagine its number one cooking method, so it seemed churlish not to try two varieties. One, from the regular menu, featured a wide selection of dried fruits, the apricots proving a particularly good partner to the meat. The other, from the daily specials, was not wildly different but contained more of a fruit and nut mix. Both dishes arrived piping hot and full of flavour under their traditional domed lids, but the problem was the meat: in both cases, half the pieces were meltingly tender, the others as tough as Moroccan leather, turning the experience into a rather bizarre culinary lucky dip. Sides of couscous and sauteed potatoes were good. The menu goes more international with the puddings, so don’t panic if your night out is incomplete with cheesecake. For those staying authentic, one portion of irresistibly squidgy, nutty Moroccan sweetmeats with coffee or mint tea is enough for two. La Fibule has no alcohol licence which means you can take along and enjoy your favourite wine and save a few quid. Staff will happily open it and provide glasses. Don’t fret if you forget: there’s an off licence a few doors down with a reasonable selection including chilled whites. All the soft drink options you would expect are in place. La Fibule is a fun, cosy and reasonably priced part of Moseley’s dining scene. The kitchen makes a few mistakes but it also turns out some knock-out dishes. Likewise, service comes and goes but is always warm and well-meaning. When you can leave with a full belly for £25 a head (plus the cost of your BYO), it’d be a bit over the top to carp at a few rough edges.